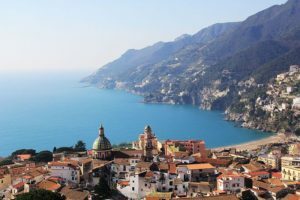 Among the most famous places of the Amalfi coast stands Vietri sul Mare, a small village near Salerno where you can go by car or bus from the main city of the Campania region. You can also choose to contact us to hire a professional driver that can take you there in a comfortable car. Vietri sul Mare is a World Heritage Site since 1997 along with the other villages of the Amalfi coast. You can think this small village as divided into two parts: one is farthest from the sea and is full of small craft shops; the other one is right next to the sea and includes beaches and clubs where nightlife takes place on summer evenings. 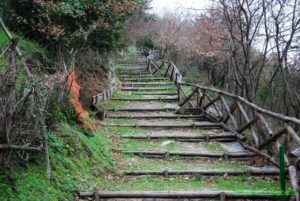 Of the history of Vietri there is no certain information: it surely was an Etruscan settlement. According to some sources it was probably part of the Roman ports. The beaches of Vietri sul Mare are very comfortable and fascinating because of the rocky coasts. But in addition to all that concern the beach life, it is important to known that the village has a lot of different attractions. The ceramic of the place is famous all over the world and it is possible to visit one of the best factories of pottery, the Solimene. You can feel the charm of the factory already in its architecture, designed by Paolo Soleri, which shows its products in the façade as it shines in the sunlight. It is one of the most important examples of organic architecture of the region. If you intend to explore the Vietri artisanship in depth, you can visit the Provincial Ceramics Museum, located in some of the rooms of Villa Guariglia. In there, you can see ceramic objects of religious character, vases, bowls and ceramic productions of the German period of Salerno. In Vietri sul Mare it is also possible to visit several churches, like the one of seventeenth-century origin of the Annunziata e del Rosario. Among the architectures to visit also stand out Villa Guariglia, located in a garden in a very panoramic spot, and towers like the Dragonea one (1100), that of Marina di Vietri, that of Marina d’Albori. Plus, those who love spending time in large green areas can visit the Parco Croce, in Albori. It is a small oasis near Mount Falerio where you can admire the Mediterranean forest with laurel, tree heath, phyllaries, holm oak, rosemary, thyme, myrtle. In the same oasis there is the “Il Cesare” spring.